Can a healthy Masterson fix his command and rebound on his former club? Woah, what a couple of days. A flurry, no, a blizzard of deals were made at baseball’s Winter Meetings yesterday. The storm is by no means over, as there are still some big name dominoes that have yet to fall. While the blockbuster deals involving Jimmy Rollins, Matt Kemp, Yoenis Cespedes and others have stolen the headlines, some notable free agent veteran arms have found new homes. Overlooked by some, these transactions will have immediate fantasy repercussions. Santana pitched well for Atlanta in 2014, winning 14 games behind a 3.95 ERA and 179 strikeouts. One of the few big league pitchers to ever successfully rehab and pitch through a partially torn UCL, Santana was unable to land a multi-year contract over the past couple of years due to free agent draft pick compensation and uncertainty around the elbow. However, Santana has been remarkably durable throughout his career, failing to reach 150 innings only one time since 2005. The Twins seem comfortable with him, as they gave him a 4-year deal (with an option attached) for 54 million dollars on Thursday. He’ll slot in behind an improving Phil Hughes in 2015. There’s no doubt that Santana benefited greatly from his short stay in the National League. He saw his strikeout rate (K%) balloon to 21.9%, his best since 2008. Santana, who turns 32 today, took advantage of facing the opposing pitcher. According to Mike Petriello of Fangraphs, Santana fanned 23 of a possible 60 pitchers in their plate appearances last year. The right-hander got almost 2% more swings and misses in 2014 then he did the year prior as well. He did this by fooling the opposition into chasing pitches outside the zone, again seeing a 2% increase in his O-Swing%. The move to Target Field should be good for him. He, like former gopher ball machine Phil Hughes has historically had a problem with the long ball, something that the Twins’ new stadium has fixed for Hughes. Like Hughes, Santana has evolved a bit in recent seasons. Since 2011, he’s induced grounders at least 42.7% of the time. Couple this with Target Field’s uncanny ability to depress power and Santana should be quite comfortable rocking the Minnesota pinstripes in 2015. Of course, he doesn’t come without his concerns either. We know about the UCL, and that’s not something that just goes away. In fact, there are really no stories of pitchers successfully being able to overcome that completely until they go under the knife. Santana also threw more sliders than any other pitcher in baseball over the last two seasons. In case you weren’t aware, sliders are elbow mutilators. Nevertheless, Santana is a slightly above average arm and if he can avoid landing on the disabled list, he will probably wind up being a pretty good value for the Twins over the course of his contract. What they are paying him is comparable to what Brandon McCarthy and Fransisco Liriano got in their respective deals, with the inly caveat being that Santana has been lightyears more durable. 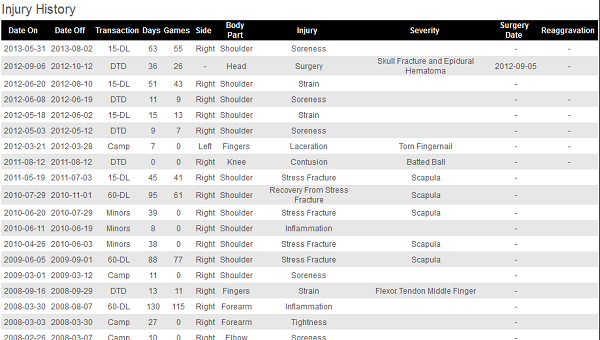 The verdict here is that Santana will likely continue to be a solid SP4 or 5 for your mixed league fantasy team. Unfortunately though, his whiff rate is going to come down some. The Dodgers have been nothing short of busy. They shipped off Dee Gordon, Dan Haren and Matt Kemp on Thursday in return for Jimmy Rollins, Yasmani Grandal, Howie Kendrick and several prospects. They also cleared salary room for future transactions. To replace Dan Haren they signed veteran right-hander Brandon McCarthy to a 4-year contract. McCarthy will be immediately inserted into one of baseball’s best starting rotations that includes the likes of Clayton Kershaw, Zack Greinke and Hyun-jin Ryu. McCarthy is an anomaly. He tossed a career-high 200 innings in 2014 between Arizona and New York, but he’d gone past 111 innings just one other time in his career. McCarthy drastically outperformed his ERA last year before being shipped to New York. Once he got the Bronx, things corrected themselves. Go figure. After the trade, McCarthy was money, posting a 7-5 record with a 2.89 ERA in 14 starts. He was one of the best pitchers in baseball down the stretch. Your guess is as good as mine as to how his shoulder is still attached. He’s missed an almost infinite amount of time with throwing shoulder injuries throughout his career. You could always, always, always pencil McCarthy in for a DL stint, but it didn’t happen in 2014. Is it just a fluke that he was able to get through an entire season without landing on the DL? Maybe. Jeff Sullivan has a different take. Maybe, just maybe Brandon McCarthy has turned a corner in the health department. Supposedly he started a new workout routine last winter which allowed him to get his body in better shape. Lifting heavier weights helped him physically in order to deal with the long, grueling season. This theory may have some staying power as his average fastball velocity went up more than 2% between 2o13 and last season. It’s probably safe to assume that his shoulder is feeling pretty good if he’s throwing the ball harder. As I mentioned, he really struggled in Arizona before being shipped to the Bronx. However, his peripheral numbers were still solid. Some bad luck was likely the culprit there. After the move, McCarthy dominated. He and catcher Brian McCann tried a new approach to keep hitters off balance, and it worked. This included throwing a ton more four-seam fastballs up in the zone, laying off the sinker and mixing in his cutter about 20% of the time. These adaptions helped McCarthy post the best groundball rate (GB%) and strikeout percentage (K%) of his career, 52.6% and 20.9% respectively. Digging deeper, McCarthy allowed a lot less contact and in turn induced a ton more whiffs. He increased his swinging strike percentage (SwStr%) by a robust 2.9%. Steamer projects McCarthy and free agent right-hander James Shields to have very similar 2015 seasons. Shields, 33 is two years older than McCarthy and will come at a much higher free agent cost. If McCarthy can stay healthy, and that is a big if, the Dodgers may have acquired a #2 for the price of a #4. More whiffs, better velocity, a more articulate use of his arsenal and a finally healthy shoulder may make Brandon McCarthy a steal in the ladder portion of your fantasy draft next year. In an effort to rebuild their rotation, the Red Sox seem to be going the way of the groundball. 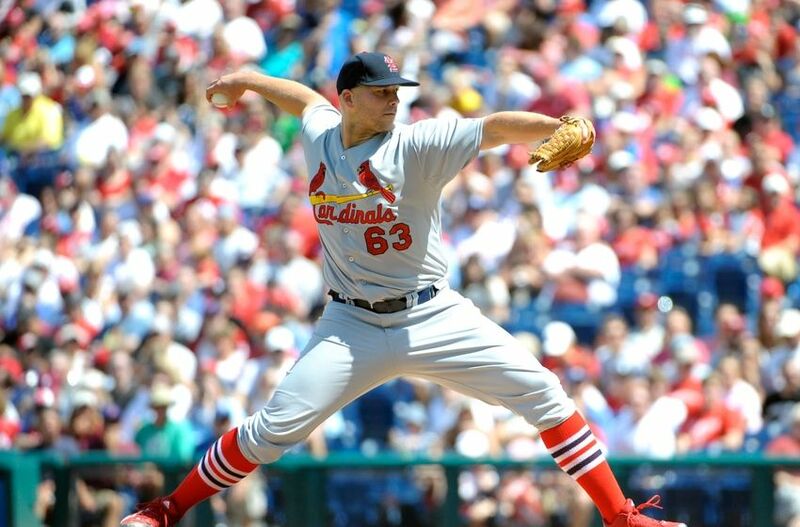 They’ve acquired Wade Miley, Rick Porcello and now Justin Masterson, who pitched for the team in 2008 and 2009. Compared to the market, Masterson came relatively cheap and represents a low-risk addition to their rotation. Boston has guaranteed Masterson 9.5 million dollars for his services in 2015, with incentives if he reaches certain innings thresholds. The trend here is to force the opposition to beat the ball into the ground. Masterson definitely fits that mold. The lanky right-hander has never recorded a groundball rate (GB%) below 53.6% in his career, an impressive feat. In 2013 at age 27, Masterson broke out. He won 14 games for Cleveland en route to a 3.45 ERA, 1.20 WHIP and a massive spike in strikeouts. He seemed primed to enter free agency after 2014 and demand a big contract. However, Masterson regressed and was an almost complete mess a year ago. Between Cleveland and St. Louis, he posted a career-worst 5.88 ERA, earning himself a demotion to the Cardinal bullpen by year’s end. While Masterson definitely got unlucky in the BABIP department last year, he pitched ineffectively. His strikeout to walk ratio fell to a career low 1.68 after he posted a solid 2.57 the year prior. Masterson has always had an issue with the free pass, but his walk rate (BB%) ballooned to just under 12% in 2014, something he could just not overcome. Opposing batters hit .278 off of Masterson last year as opposed to .220 in 2013. In all fairness, Masterson did deal with a knee injury for the entirety of 2014 that he admitted he couldn’t get right. It had a negative impact upon his performance, as we can see in his pretty drastic dip in velocity from the year prior, an almost 3 MPH dip in fastball speed. Masterson is a two-pitch hurler, and last year he reverted back to throwing his heater more than 80% of the time. During his breakout 2013, he used the fastball less in favor of more sliders. It will be interesting to see if he goes back to what worked for him during that season and use his slider more again. Masterson is a solid arm with walk issues and problems putting left-handers away. However, if he can move back to using some of the adjustments that made him so successful in 2013, we’re looking at a fantasy-relavant starting pitcher. If he can’t get his walk issues back in check, then he’s best left of off your draft board.